TOS has been updated for 080618 ! If you comment here please be aware of the terms above. Posting here means you have agreed to the terms. There is now a new journal specifically for the transfer of ownership. ownership transfer list [*new! ]This is to be used to track ownership but also be facilitated by you - please be aware of scammers and protect yourselves from being exploited! 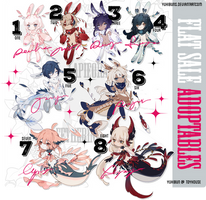 There is a sheet masterlist acting as an archive for most all yukibun designs, inquiries can be made about its entries for those concerned about scamming but it is a private document otherwise. remember to be familiar with the terms of service! The previous owner must comment with the form below once their adopt has been traded/resold/gifted to a new owner. Please don't create a new comment if the adopt has a comment here already, but reply to it with new details. Please use this format below. You may still post here regarding trades and resales but I would like to move specific ownership transfers there, where there are less cluttered comments. Please do not post here doing something against my TOS. If it's possible please don't clutter the comments too much! I'll hide comments I think aren't necessary. Thanks so much for your understanding up until now, and for waiting for me. o7 Let's all trade and resell fairly! Hello! I would like to resell this baby smoketail toyhou.se/1834633.julio since I am not that active anymore and would like him to go to a new home<33 Feel free to pm/note me! Looking for Galatiers or Celestiers, homie. These two designs have been traded to Sleepy-Snake ! reselling/trading toyhou.se/3366361.april - please pm on toyhouse if interested! Looking to trade #1 from here! i seem to be having a hard time fitting him in stories right now. Looking for any Yuki designs except lapifora and fetherings. Male or female is fine. I prefer newer designs. 125 USD which was the original price payed! Confirmed by Yuki. message me if interested! I’m wondering if she is still available!!! She is so cute! They has been resold to ! Looking to buy a galatier/vestigil~ Can also offer art/charas/myos in addition^^ Leaving this here for posterity. Hello !!! O)---) thanks so much for everyone who was interested in the flat sale T T)9 hdgds I get a bit antsy about my small designs but I am grateful to think that they can still find good homes ! AUCTION NOTES: PLEASE READ ! > This custom auction will exclude all vestigil/duodeos characters. Galatier nova is included ! If you haven't finished your MYO bon please do! Thank you again To T! EDIT: (08/06): Just a reminder about those with bon slots yet unfinished ! if you aren't sure if I've sighted it, check the masterlist! some nuggets for you /o\ I've sent them through note! it's a little bon festival this weekend! I'm not the best at making them so here's a little MYO event, if you've been holding out for a certain palette or design I hope you'll consider it! I've made some kind of shoddy bases but you can use them. I will have a look through everyone's comments and get in contact soon. If you ever change your mind, please feel free to hide your comment! Hello! I will eventually try to make a new journal with commission types and prices but this will do, please read before posting! EDIT: here are the ones I drew for this round! It is not first come first served. trick or trouble 3 [halloween raffle] !thanks for playing the almost spookerday raffle !! >> I'll draw a name within the next couple of days!! The horror Skeldas is actually a duo - frankenstarry Iskander and his creator Sullivan. They're back to their evil antics and are targeting unsuspecting innocents... and playing a little game this halloween. Sully and Iskander will hold windows showing someone's (garbled) face. They have a bad reputation for making galatiers vanish in the night... can you figure out if they're showing just any old face or their next galatier victim? I'll post a filtered image of an adoptable in my gallery, and you have to guess if it's a trick or trouble ! There'll be a form to fill in for each one. > Auction will end 48 hours from the first bid ! or single if you'd really like -- I don't think I can take more than one for now so just the one slot ! characters belong to @/quaazera above! [info] lapiflorabons received a flowery update thanks to a persistent typo wheezes -- not compulsory at all but feel free to give your bon some flowers! Please comment here with the following form! Commissions(Closed ) Thank you very much for your Support !! ★ Accept Points and Paypal " You have to pay first "
If you have any of my designs that you would like to resell/trade please note Kuriesu [not Romesu] and I will put it in this journal! Please contact current owners for more information if needed!Feel free to comment and advertise here if you'd like to resell/trade an adopt designed by me. Advertising for anything else will be marked as spam. This journal is for resells and trades of my adoptables/closed species. check the comment section for designs being re homes! 'ChiSei-Adopts' Trade/Resell Center= [3 AVAILABLE]Hello~! We finally started to finish some things. If you've purchased 'CHIDUS - TALUS - PILLOPUFF and FLUFFBEBE' from us, which you would like to resell or trade, you can make use of this journal. *Talus-Fluffbebe and Pillopuff's are added..
And if you have a toyhou.se account, please transfer your specie's creator rights to OUR toyhouse account! Just 'CHIDUS SPECIES' adopts purchased from US! Please check the list. Please let us know if you belong here or not, and inform me whenever you trade/resell an any Chidus then we can update this list! ✿ Please hide your comment once the trade/resell/pairing has been finished! ✿ You can add the prices of your commissions to the resell price ONLY if you get the permission of the artist you commissioned from. ✿ Please do the deal through notes, so that the comments section doesn't get cluttered! Edit; changed reposting rule ! you may repost your comment if it is 1 month or older. -You can hide them if you change your mind in reselling/trading. -You may repost a comment with available design(s) if it is 1 month or older. ++NEW RULE: If you are putting a MYO Heartpuff up for trade, please be sure to specify that it is a MYO in your comment! MYO HEARTPUFFS ARE NOT ALLOWED TO BE RESOLD. If you've adopted an adoptable from me and would like to give them up to a better home by trading/reselling, this is the place! My Toyhouse: https://toyhou.se/Heartpuff - If you have a toyhouse, please transfer your Heartpuff's creator rights to my toyhouse account! I wont be adding the comments anymore for quick link to this thread. You have to browse the comments in order to find the adopts that are up! yukidopt trade/resell center TOS has been updated for 080618 !